May Day, also known as International Workers' Day, is a holiday in 75 countries, but not in United States, the country where people may work the hardest of all. 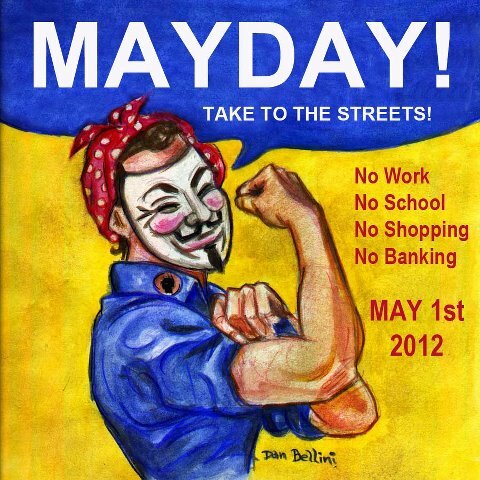 Occupy, though, has a notion to take the day for its Spring Reawakening. Its General Strike Facebook page sums up its mission: "NO WORK - NO SCHOOL - NO SHOPPING - NO BANKING - NO TRADING. THE PEOPLE OF THE PLANET WILL TAKE TO THE STREETS." Whether you're for, against or neutral on Occupy, the disruptions will affect business as usual — and that includes traffic. Nearly 60 general assemblies have "answered the call" to observe May Day. 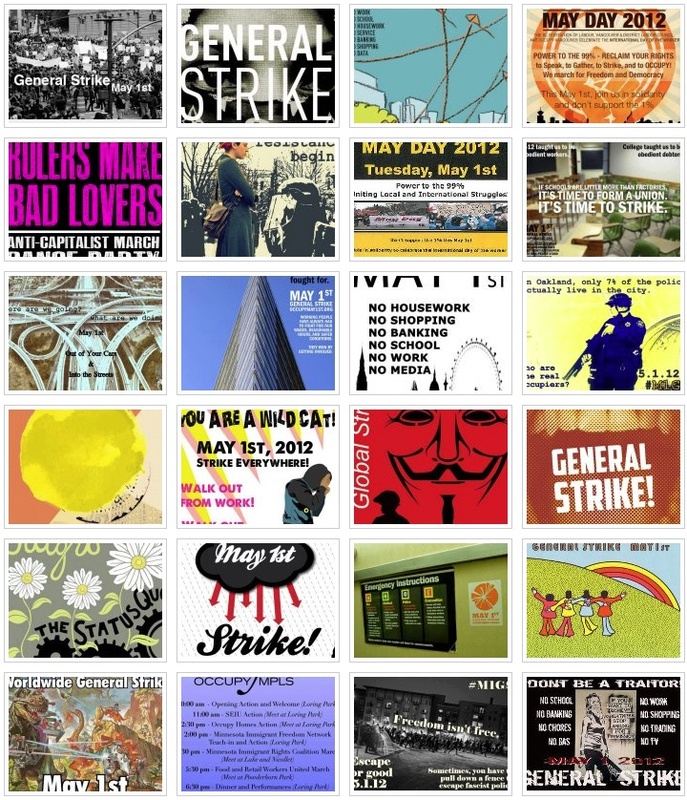 The Occupy demands: A group as large as the 99 percent is bound to have a lot of demands. 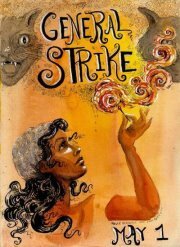 The strike ostensibly will show the 1 percent that the 99 percent matter. The demands range from supporting immigrants and labor unions (preserving bargaining rights, for instance) to reducing outsourcing. Outrage still drives the movement, and its list of injustices include onerous college debt, unaffordable health care, bullying, an insufficient minimum wage, job sexism, homelessness, foreclosures and war. 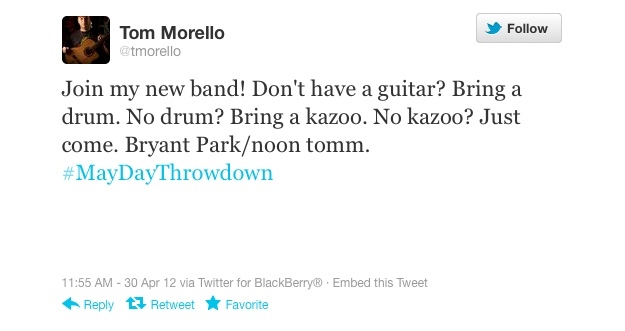 Some of the planned May Day events follow. Boston: An early 7 a.m. start kicks off a Financial District Block Party, with "Anti-Capitalist" and "Solidarity" marches throughout the city. The evening event calls for a "Death of Capitalism" Street Theater Funeral Procession that promises to travel "through areas of wealth and commerce." New York: The pop-up occupation began the night before, as people started a day early in Bryant Park, opposite the Bank of America. Organizers promise to manifest the protests as art, "transforming (the city) into a living, walking exhibition" that includes choirs, dance brigades, even clowns. 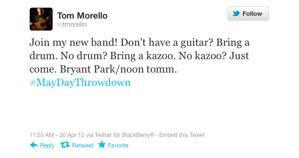 Guitarist and singer Tom Morello of Rage Against the Machine tweeted out a call for 10,000 musicians for a noonday jam. Atlanta: The Georgia capital started a day early at the Bank of America Plaza to protest a foreclosure. The May Day is designed as family friendly, with a 10:30 a.m.-1 p.m. march from Troy Davis Park to downtown, then a six-hour party at Coan Park complete with child care, "cookouts, workshops, film screening, and more." The May Day event follows on the heels of a public exchange: Late last week, a local journalist published a long, "angry breakup letter" about the "concentration of nuttery" in Occupy Atlanta, and a collective response detailed the contributors' actions and vision statements. Chicago: The city has already been dealing with protests over the closure of half of its 12 public health clinics. The Chicago Spring site lists a morning plan to "close the banks which abused their bailout funds" before a Union Park meeting, then a 1 p.m. march to Federal Plaza. Detroit: The Motor City will have a later start, with a noon assembly at Clark Park and marches that will take protesters past schools, transportation stations, and the Federal Building before ending with a general assembly at Grand Circus Park. San Francisco: A union disagreement nearly brought an occupation of the iconic Golden Gate Bridge, the span that connects San Francisco to Marin County in the north, but that high-profile maneuver has been averted. Golden Gate Ferry workers, however, will be walking out to call attention to contract disagreements over health care coverage, and morning service has been canceled. Oakland: The city emerged as the West Coast response to New York. The Bay Area metropolis, which grafted an earlier anti-police movement onto the 99 percent message, still listed a 6 a.m. occupation of Golden Gate Bridge on its main page as late as April 30, but a tentative schedule listed "anti-capitalist," "anti-patriarchy" and "anti-gentrification" brigades starting at 8:30 a.m., with a downtown convergence, afternoon march and an evening "reconvergence." Los Angeles: May Day has been the occasion for immigrant rallies in the City of Angels. This year, a "4-Winds Convergence" will emphasize labor themes and more through four caravans. After a 10 a.m. rally, the caravans will take four separate routes to Sixth and Main streets for a 2:30 meeting point, and later the financial district. 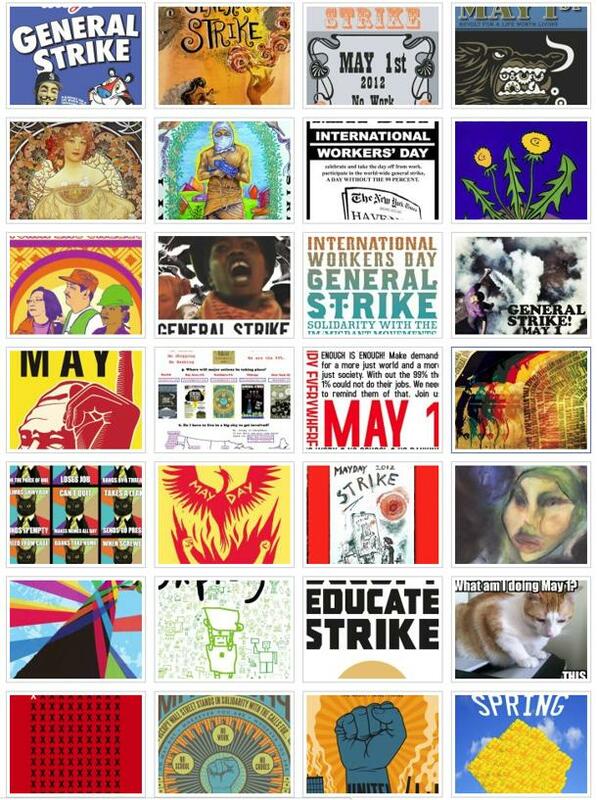 General Strike art: Whatever the outcome of May Day, one thing has clearly emerged -- the return of propaganda art.